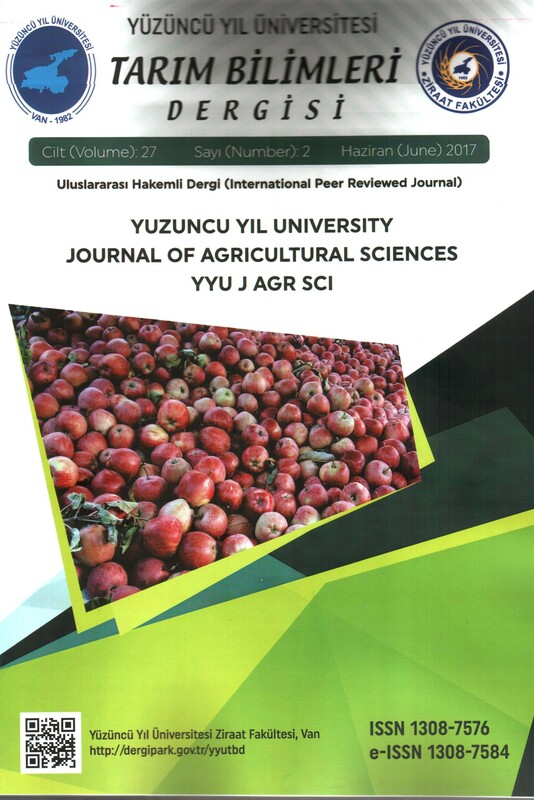 The study was conducted to investigate nematode faunal structure in some pastures of Muş province, in 2015. Soil samples were taken from pastures by stopping at every 5 km of Muş-Bingol road. Nematodes were reovered from soil samples by using petri-dish method. Twenty nine genera and one species fron the nematode fauna were identified. ; 8 plant parasitic, 9 bacterivores, 4 fungivores, 1 predator and 5 genera belonged to omnivore groups. The prominent genera were Helicotylenchus, Tylenchus, Pratylenchus and Merlinius as plant parasitic group; Acrobeloides, Cephalobus and Monhystera as bacterivores; Ditylenchus, Tylencholaimus and Aphelenchus from fungivores; Mononchus as predators; Prodorylaimus and Aporcelaimellus as omnivores. The proportions of trophic groups in the fauna in terms of abundance were calculated as 32% plant parasitic nematodes, 33% as bacterivores, 32% as fungivores and as 29% omnivores. The results revealed that all the trophic groups had close diversity and abundance values, except the predator group which was the least in the fauna. It might be concluded that, in the study area, the diversity and abundance of plant parasitic nematodes were not very high and free-living nematodes were in a fair state. Çalışma Muş ilinde bazı meralarda nematod fauna yapısını incelemek üzere 2015 yılında yürütülmüştür. Muş-Bingöl karayolu üzerinde bulunan meralardan her 5 km’de bir durularak toprak örnekleri alınmıştır. Toprak örneklerinden nematodların elde edilmesi için Petri kabı yöntemi kullanılmıştır. Çalışmada nematod faunasına ilişkin 27 cins ve bir tür tespit edilmiş olup, bunlardan 8 cins bitki paraziti, 9 cins bakterivor, 4 cins fungivor, 1 cins predatör ve 5 cins omnivor gruba ait nematodlardan oluşmaktadır. Bitki paraziti nematodlardan Helicotylenchus, Tylenchus, Pratylenchus ve Merlinius cinsleri; bakterivorlardan Acrobeloides, Cephalobus ve Monhystera; fungivorlardan Ditylenchus, Tylencholaimus ve Aphelenchus; predatörlerden sadece Mononchus; omnivorlardan ise Prodorylaimus ve Aporcelaimellus cinslerinin ön planda olduğu belirlenmiştir. Trofik gruplardan bitki paraziti nematodların faunadaki oranı %32, bakterivorların %33, fungivorların %32, predatör ve omnivorların oranı ise %29 olarak hesaplanmıştır. Trofik grupların dağılımının birbirine yakın değerler aldığı görülmüştür. Sonuç olarak, çalışma alanındaki bitki paraziti nematodların çeşitlilik ve yoğunluklarının yüksek olmadığı ve serbest yaşayan nematodların ise orta seviyede bir yapıya sahip oldukları söylenebilir. Anonim (2016a). Muş il valiliği verileri. Erişim tarihi 14.12.2016. Anonim (2016b). Muş meteoroloji il müdürlüğü kayıtları. Erişim tarihi: 05.11.2016. Anonim (2016c). Muş il gıda tarım ve hayvancılık müdürlüğü kayıtları. Erişim tarihi: 12.12.2016. Berkelmans R, Ferris H, Tenuta M, Van Bruggen A H C (2003). Effects of long-term crop management on nematode trophic levels other than plant feeders disappear after 1 year of disruptive soil management. Applied Soil Ecology, 23(3), 223-235. Bongers T, Yeates GW (1988). Report on a workshop: Nematodes in natural systems; the use of nematodes in environmental studies. Pedobiologia 32:88. Bongers T (1990). The maturity index: An acological measure of an environmental disturbance based on nematode species composition. Oecologia, 83: 14-19. Bongers T, Ferris H (1999). Nematode community structure as a bioindicator in environmental monitoring. Trends in Ecology & Evolution, 14(6), 224-228. Cesarz, S, Reich P B, Scheu S, Ruess L, Schaefer M, Eisenhauer N. (2015). Nematode functional guilds, not trophic groups, reflect shifts in soil food webs and processes in response to interacting global change factors. Pedobiologia, 58(1), 23-32. De Deyn, G B, Raaijmakers C E, Zoomer, H R, Berg M P, de Ruiter P C, Verhoef H A, ... & van der Putten, W. H. (2003). Soil invertebrate fauna enhances grassland succession and diversity. Nature, 422: (6933), 711-713. Ferris H, Bongers T,. de Goede R G M (2001). A framework for soil food web diagnostics: Extension of the nematode faunal analysis concept. Applied Soil Ecology 18: 13–29. Ferris H, Bongers T (2006). Nematode indicators of organic enrichment. Journal of Nematology, 38:1, 3–12. Hopper B E (1958). Plant-parasitic nematodes in the soils of southern forest nurseries. Plant Disease Reporter, 42(3), 308-14. Li Y, Wu J, Chen H, Chen, J (2005). [Nematodes as bioindicator of soil health: methods and applications]. Ying yong sheng tai xue bao= The journal of applied ecology/Zhongguo sheng tai xue xue hui, Zhongguo ke xue yuan Shenyang ying yong sheng tai yan jiu suo zhu ban, 16(8), 1541-1546. McSorley R, Frederick J J (1999). Nematode population fluctuations during decomposition of specific organic amendments. Journal of Nematology, 31(1), 37. Neher D A, Wu J, Barbercheck M E, Anas O (2005). Ecosystem type affects interpretation of soil nematode community measures. Applied Soil Ecology, 30(1), 47-64. Neher, D A (2010). Ecology of plant and free-living nematodes in natural and agricultural soil. Phytopathology, 48: 371-394. Parmelee R W, Alston D G (1986). Nematode trophic structure in conventional and no-tillage agroecosystems. Journal of Nematology, 18(3), 403. Popovici I, Ciobanu M (2000). Diversity and distribution of nematode communities in grasslands from Romania in relation to vegetation and soil characteristics. Applied Soil Ecology, 14(1), 27-36. Sarathchandra S U, Ghani A, Yeates, G W, Burch G, Cox N R (2001). Effect of nitrogen and phosphate fertilisers on microbial and nematode diversity in pasture soils. Soil Biology and Biochemistry, 33(7), 953-964. Tenuta M, Ferris H (2004). Sensitivity of nematode life-history groups to ions and osmotic tensions of nitrogenous solutions. Journal of nematology, 36(1), 85. Watson R N, Mercer C F (2000). Pasture nematodes: the major scourge of white clover. In Proceedings of the Conference-New Zealand Grassland Association (pp. 195-200). Wasilewska L (1994). The effect of age of meadows on succession and diversity in soil nematode communities. Pedobiologia, 38: 1–11. Wilson M J, & Khakouli-Duarte T (Eds.) (2009). Nematodes as environmental indicators. CABI. Yeates, G W (1984). Variation in soil nematode diversity under pasture with soil and year. Soil Biology and Biochemistry, 16(2): 95-102. Yeates G W, Bongers T, de Goede R G M, Freckman D W, Georgieva S S (1993). Feeding habits in soil nematode families and genera—an outline for soil ecologists. J. Nematol. 25:315–31. Yeates G W, King K L (1997). Soil nematodes as indicators of the effect of management of grasslands in the New England Tablelands (NSW): comparison of native and improved grasslands. Pedobiologia 41:526–536. Yıldız Ş ve Elekçioglu İ H (2011). Şanlıurfa ilinde tarımsal ve doğal alanlarda nematod biyoçeşitliliği. Türk. Entomol. Derg., 35 (2): 381-394. Yildiz, S 2012. Nematode biodiversity in a semi-arid pasture under different grazing regimes. Afr. J. of Ag. Res., 7(3): 414-417. Yildiz S, Handoo Z, Carta L, Skantar A and Chitwood D (2012). A survey of plant-parasitic nematodes associated with forage crops in Bingol, Turkey. Nematologia Mediterranea, 40:73-77. Zolda P (2006). Nematode communities of grazed and ungrazed semi-natural steppe grasslands in Eastern Austria. Pedobiologia, 50(1), 11-22.